This week’s Project Run & Play theme is anything with chevrons. I once again wasn’t sure I would find time to sew along, but in the end I decided to make a quick dress for spring. I had some of the chevron left over from my Kitty Chevron Stripes pullover (which Bean still wears and LOVES) and some striped fabric left over from my Casual Lady shirt and I thought mixing the two would look cool. When I look back through the posts from this year I realize I’ve been trying to mix prints and colors more than usual. I must be entering a new phase hehe. I do love how these two look together though. 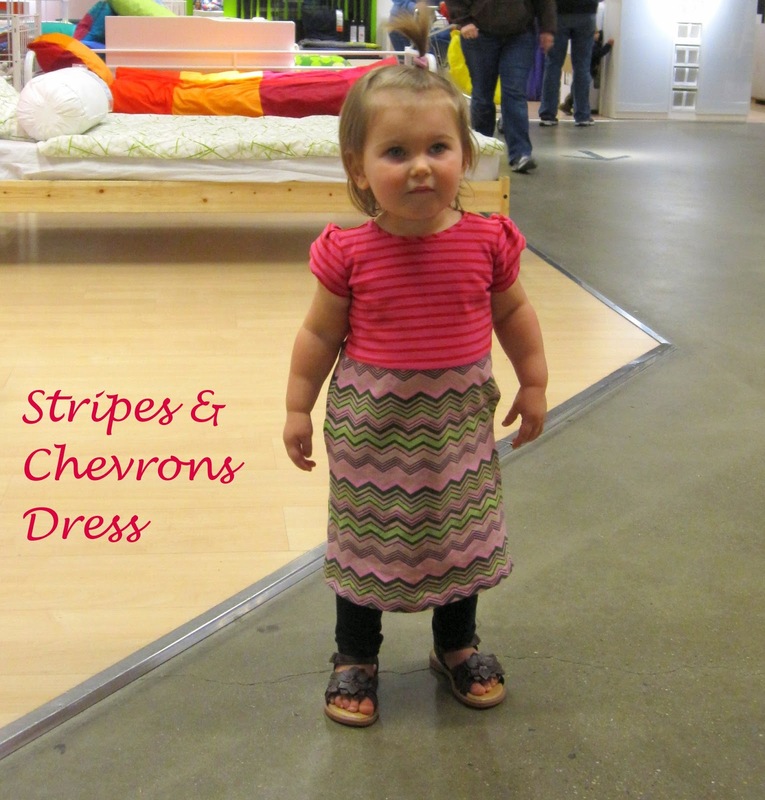 I think the chevron print is a little over the top and would be too busy on it’s own. Paired with a bright stripe I think it gets to show off, but not be too crazy. 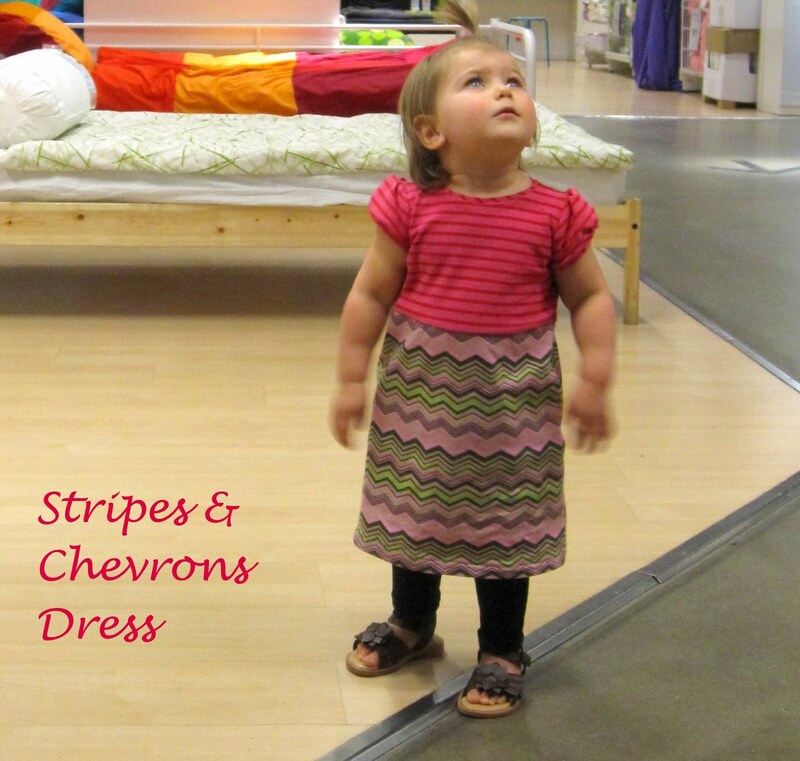 The top of the dress is the Natalie Dress (affiliate link) from Peek-A-Boo Patterns and the bottom is just an a-line shaped skirt with pockets. I adore the shape of the Natalie bodice. It is so sweet with those puffy sleeves. The above picture of the dress on the hanger does not do the sleeves justice. 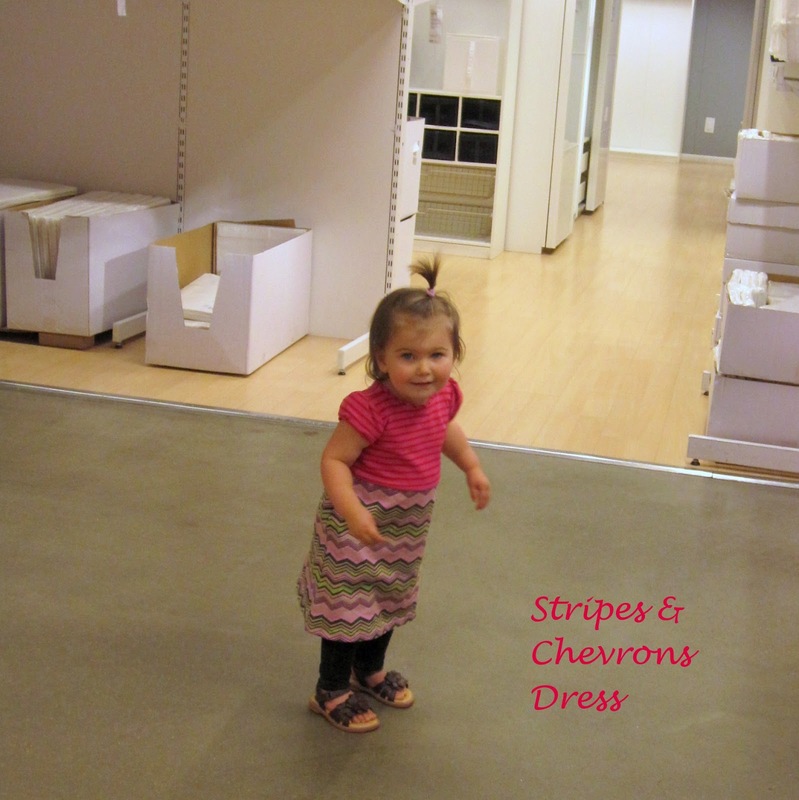 We didn’t have time for pictures at home, so I took a few pictures while we were out at IKEA. It’s not exactly an ideal place for a photo shoot, but it was better than pictures of her sitting in her car seat hehe. She is normally stuck sitting in the cart, but I let her out for these shots. Her face in this picture says it all. “Am I really allowed to just walk around?!?!? !” It was fun to see her mind work through this tiny new moment of freedom. 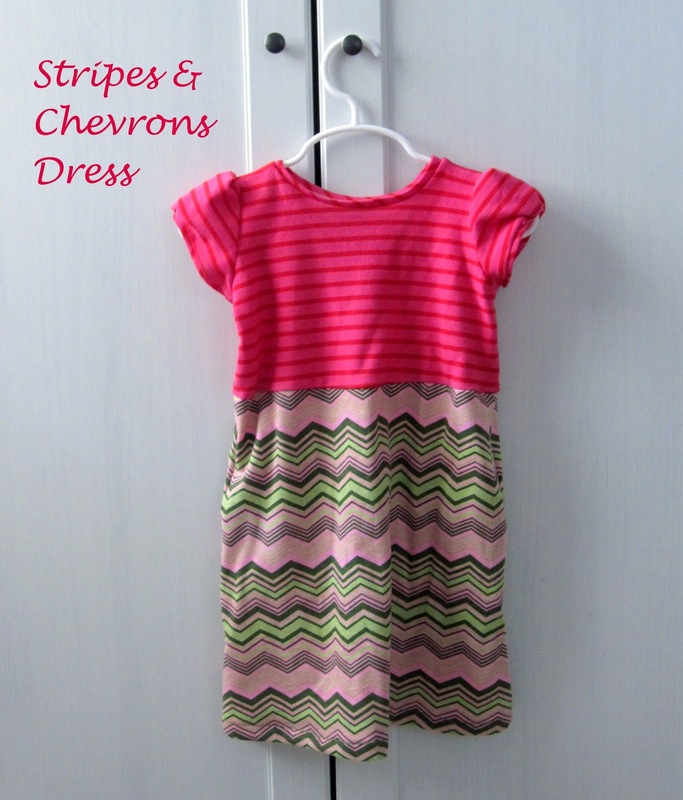 Go check out the other fun chevron outfits in the sew along and don’t forget to vote on Friday for your favorite All Star Designer’s look! I have recently added affiliate links for Blank Slate Patterns and Go To Patterns on my sidebar as well as in some of the links in this post, but I sewed using their patterns long before even considering it. These are just great patterns that I truly stand by and I am excited about being an affiliate. Also, I finally signed up at bloglovin. Not sure if I’m going to like it yet, but I thought I’d give it a whirl hehe. I love the combo! I love seeing your little Bean grow up too! She is getting so big! I just love the look of this dress…it looks like summer to me. And I love the unusual pattern combination. Well done! Looks great I really need to get around to buying some digital patterns. Your creations always get me thinking that. Really nice, also with leggings! Love the stripes with the chevrons! so cute……….Thank you for sharing with the Clever Chicks Blog Hop this week; I hope you’ll join us again!